This day and age, working moms are the norm. With 70% of mothers with children under 18 entering the workforce, some are even the primary earners of their household. Integral to today’s economy, women themselves make up roughly 47% of workers in the U.S., whether it be management positions or civilian labor force. According to Entrepreneur, women-owned firms have grown by 1.5 times the rate of other small enterprises over the last 15 years. Female entrepreneurship is on the rise, with more than 9 million women-owned businesses in the U.S. today– and there’s still a long way to go. 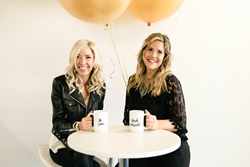 Entrepreneurs and ChicExecs co-founders Nikki Carlson and Kailynn Bowling are no strangers to breaking into the world of business. Never focusing on their gender as a setback, but instead their own goals, passions, and talents, the duo has launched several product lines and helped to shape the public relations industry. Balancing motherhood and the challenges that come with being in the entrepreneurial world, the founders of ChicExecs empower, motivate and inspire the women in their workplace to break past boundaries by utilizing productivity and finding their strengths. Consistently growing in experience, ChicExecs has garnered respect in the industry and continues to pioneer new milestones for their clients. Named by Entrepreneur as one of the best company cultures in America, ChicExecs is a one-stop shop for brands. With social media, influencers, retail strategy and public relations, the company is at the forefront of supporting modern businesses. Making up half of the workforce just last year, women are successfully holding management, professional and workplace related positions. Navigating a team of hardworking, empowered, and creative women, ChicExecs is combining the talents of the female workforce with high power performance for brands. Nikki Carlson and Kailynn Bowling founded ChicBlvd Inc. which is the parent company of three divisions including ChicBlvd Magazine, ChicExecs Brand Strategist Firm and ChicBuds. They bring more than 30 years of advertising, marketing and PR experience combined with 15 years of business management, retail and sales. ChicExecs launched in 2006 and quickly garnered over 200 clients and a network of 40,000 small businesses who benefit from their innovative new system that has generated features in countless well-known media outlets. Creating an innovative approach to helping small-medium businesses receive retail strategy including retail orders, social media, and media coverage, ChicExecs is an “out of the box” PR and retail strategy company.